4 goal Warrior DJ Good. Photo by IceHockeyMedia. 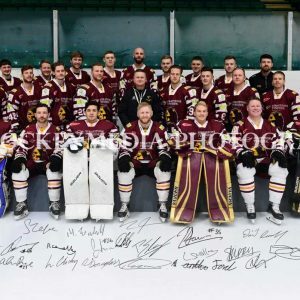 Whitley Warriors achieved an 8-5 victory over Solihull Barons at Hillheads on Sunday evening. 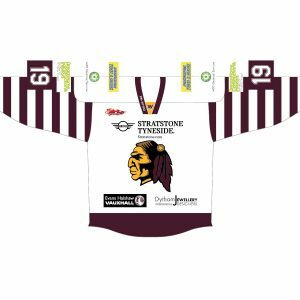 Heading onto the ice with eighteen skaters, the Warriors’ line-up saw the return of Alternate Captain Jordan Barnes, defenceman Ross Connolly, shot stopper Richie Lawson and Canadian import Phil Edgar, all of whom missed out on Whitley’s 4-0 victory over Nottingham Lions last weekend. 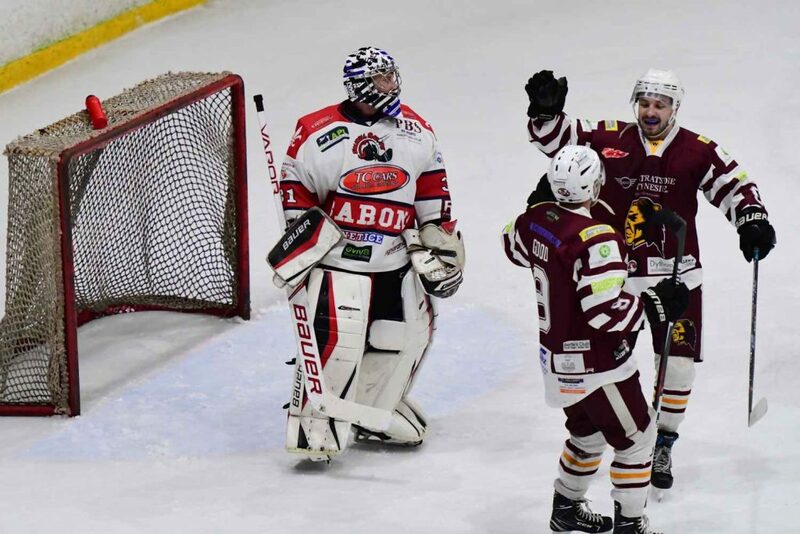 Meanwhile, Solihull’s fifteen-man outfit made the trip with top points scorer Niklas Ottosson and Brittle brothers Luke and Adam whilst netminder Sam Hewitt took his place between the pipes ahead of Player-Coach Daniel Brittle who instead provided instruction from the bench. Callum Watson with the assist on DJ Good’s first goal. Photo by IceHockeyMedia. After the Warriors’ early offensive work resulted in a facial injury for Barons’ forward Elliot Farrell, Solihull bounced back to take the lead on 2:10 as two-way player Matthew Maurice fired home to the left of starting netminder Jordan Boyle. Responding with urgency, the Warriors hit back just under two minutes later when forward Callum Watson’s rebounded shot was picked up by DJ Good who calmly bagged his team an equaliser; Latvian defenceman Rolands Gritāns also assisting. Moments later, Hewitt was beaten for a second time but, the puck having bounced off Watson’s foot, the goal was instantly ruled out. 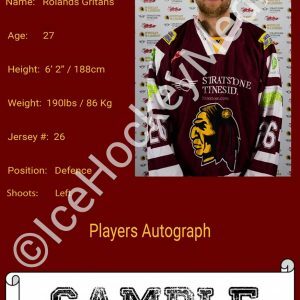 Remaining dominant in Solihull’s defensive zone, the Warriors took the lead shortly afterwards when Good collected his second of the evening courtesy of Gritāns’ unwavering work ethic. Toiling for a third goal, Whitley made life incredibly difficult for Hewitt and it showed as Good completed his hat trick on 13:53 by looping the puck over the netminder following a succession of saves from the Baron; Gritāns and Watson again teaming up to assist. 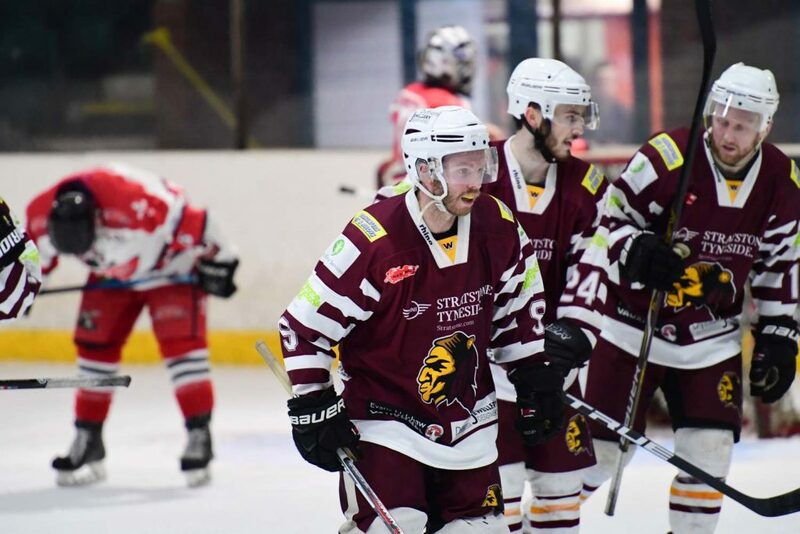 Versatile forward Edgar then tried his luck with a backhanded shot which Hewitt comfortably saved before forward Kyle Ross also impressed, weaving through Solihull’s defence to create opportunities for his teammates. With the Warriors causing problems for the Barons, Maurice resorted to crosschecking and incurred a penalty in the process. However, heartened by Whitley’s inability to capitalise on the power play, Solihull seized possession to make it 3-2 with a superb shorthanded shot from forward Adam Brittle on 18:54. Sam Hewitt denies Phil Edgar on the doorstep. Photo by IceHockeyMedia. 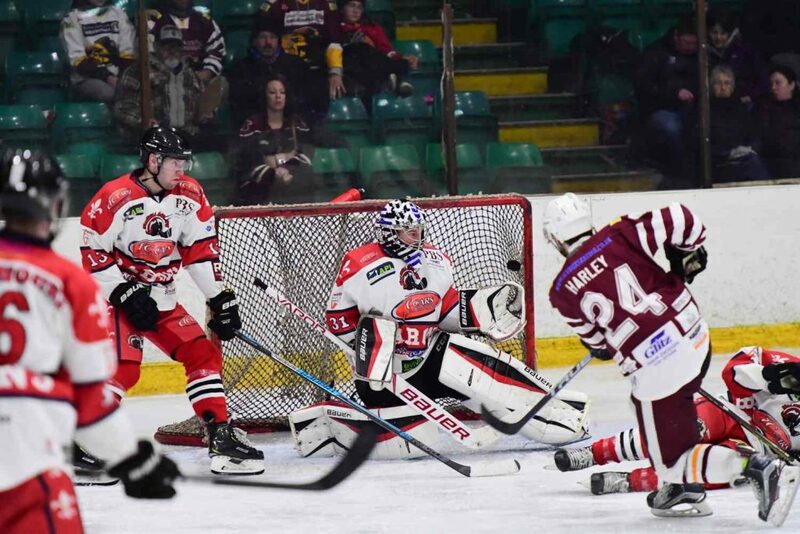 Heading into the second period with this narrow lead, the Warriors were eager to resume their earlier dominance and did so, gradually building possession in Solihull’s defensive zone before restoring their two-goal cushion as Alternate Captain Sam Zajac shot from a narrow angle on 23:45. Unstoppable, Whitley made it 5-2 as Barnes slotted Edgar’s backhanded pass beyond Hewitt less than four minutes later. Retaliating, Solihull were then halted on the breakaway when shot stopper Boyle tripped his opponent. Remaining a threat though shorthanded, the Warriors provoked a tripping offence from defenceman Elliot Perrin to go even-handed against their visitors. Almost immediately, Whitley achieved a 6-2 lead as Good slotted home his fourth goal of the evening on 30:09 courtesy of defenceman Harry Harley and Captain Dean Holland. 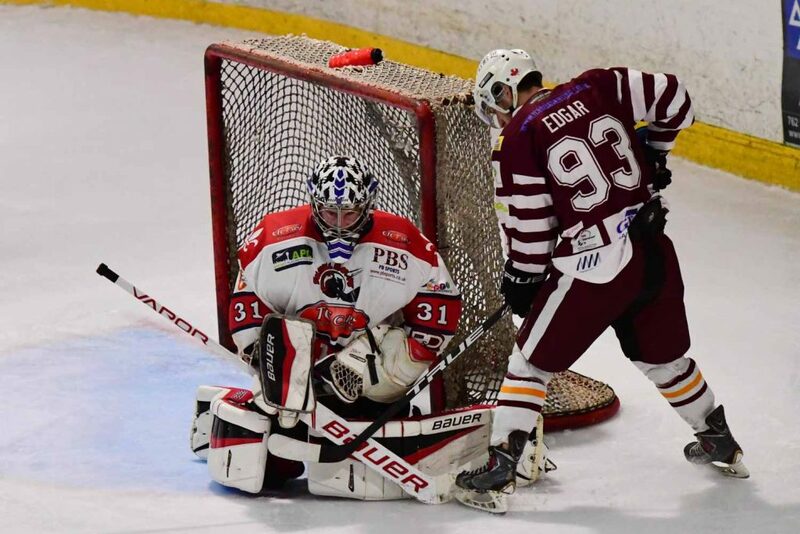 Four seconds after returning to full strength, the Warriors were punished again as Ross was found guilty of roughing, allowing the Barons the chance to score a delayed penalty goal as Ottosson raced free of Whitley’s defence to find the target. As the period came to a close, Solihull hit the post three times in quick succession after a hooking call was made against Watson and, maintaining this pressure on the power play, the Barons made it 6-4 as forward Luke Brittle netted from close range in the final second of the period. Harry Harley scores high over the glove hand of Hewitt. Photo by IceHockeyMedia. Switching Boyle for netminder Richie Lawson at the beginning of the third stanza, Whitley instantly added to their tally to regain their three-goal lead as Player-Coach David Longstaff slipped the puck home on 41:09 following Harley’s long range shot. Seventy six seconds later, Hewitt was picking the puck out of his net for an eighth time as the Warriors extended their lead to four, this time left winger Ben Campbell holding onto possession to feed a pass to Harley who netted glove side. A roughing penalty for Holland soon after this goal presented Solihull with a power play and the side capitalised within nine seconds as defenceman Daniel Harrison tapped the puck past Lawson. Shortly after calling a timeout on 49:38, Whitley were given the advantage when Harrison was sidelined for holding but the outfit could not make the most of their additional skater. Trying to carve out a ninth goal, Edgar appeared particularly dangerous in offence and came close to scoring whilst Campbell struck the post on the breakaway before seeing his second attempt saved by Hewitt. With neither team able to add to the scoreboard in the final stages, and the Barons perhaps feeling the effects of their short bench, the Warriors remained in control for the remainder of the game to complete their 8-5 victory.